Deepavali this year will have two delights in the box-office and they are Kamal Haasan’s ‘Thoongavanam’ and Ajith’s ‘Vedalam’. While there are various speculations around the movies’ release dates, official announcements have finally been made. 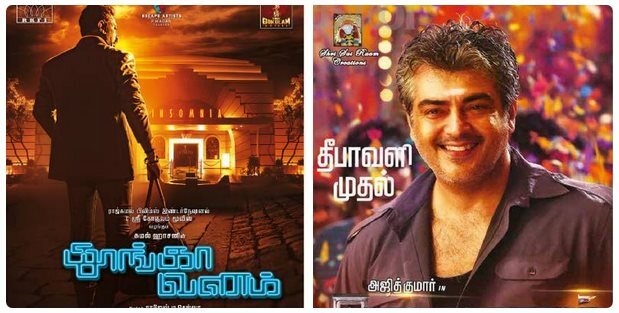 Both ‘Vedalam’ and ‘Thoongavanam’ will hit the screens on November 10, exactly on Deepavali day. Earlier, it was said one of these films would make it to theatres a few days before itself. Directed by Rajesh M Selva and produced by Raaj Kamal Films International and Sri Gokulam Movies, ‘Thoongavanam’ is a thriller which tells about the life of a Narcotics Control Bureau official. Trisha and Asha Sarath are there, while music is by Ghibran. Helmed by Siruthai Siva and produced by A M Rathnam, ‘Vedalam’ is a commercial entertainer with family sentiments and romance. Ajith is said to be playing a role with different shades. Shruti Haasan is the heroine, while Lakshmi Menon plays the thala’s sister. Anirudh has scored the music.